Brighton Ford is proud to announce that they have won the Livingston Daily’s People’s Choice Award for Best Dealership Auto Service! We would like to thank our customers for voting for our Service Department #1 in Livingston County! 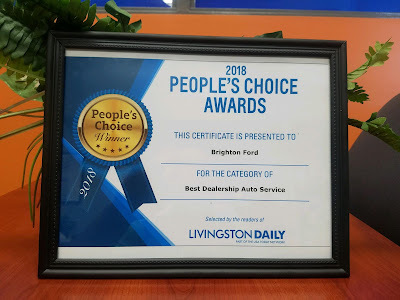 This award means so much to Brighton Ford because it is voted on by the residents of Livingston County. Without our customers we would be nothing, so thank you from the bottom of our hearts! Brighton Ford Service has the Ford trained Technicians that know your cars, truck or SUV inside and out. We provide the best service at the best price hands down. We have Master Certified Diesel Technicians that can repair Cummins and all other diesel engines. Our factory trained Technicians are the best at oil changes, brake repair, transmission work, engine repair, suspension work and any other auto repair you could need.